English: Pikachu's Great Sparking Search! Summer! Everyone is full of energy today. Pikachu and friends play with their beach ball! 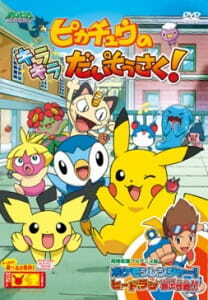 Pikachu and Pochama are chasing and diving in a river when they drift over and see a metropolis. "Where are we?" they said, searching from the rooftops of the buildings. Suddenly, with a bang, jagged-eared Pichu and Muchul collide. The two argue in an angry mood. "Sparkling is gone! It was the present to give to Kireihana..." Besides, today is her birthday!? This is troublesome! We must hurry and search. Moreover, Nyarth-tachi are aiming too! Thus, the Great Sparkling Search begins!